SUBHEAD: Attorney General Sessions goes to court to seize website's database and visitor information. 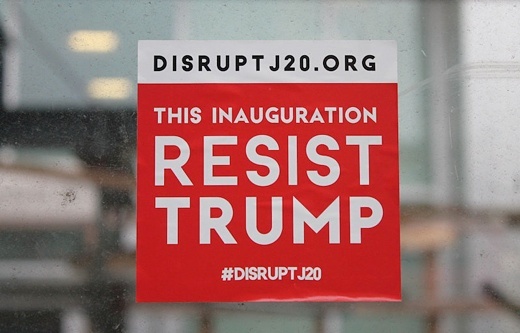 Image above: A sticker advertising www.disruptj20.org in Washington, D.C. in January 2017. Photo by Elvert Barnes. From original article. The U.S. Department of Justice (DOJ) is demanding details on visitors to an anti-Trump protest website in what consumer advocates are calling an “unconstitutional” invasion of privacy. The warrant was made public Monday, when DreamHost announced its plans to challenge the government in court. The DoJ declined to comment. No plausible explanation exists for a search warrant of this breadth, other than to cast a digital dragnet as broadly as possible. But the Fourth Amendment was designed to prohibit fishing expeditions like this. Those concerns are especially relevant here, where DOJ is investigating a website that served as a hub for the planning and exercise of First Amendment-protected activities. A court hearing on DreamHost’s challenge to the warrant will be held this Friday in Washington, D.C.
SUBHEAD: More reporting on this issue. 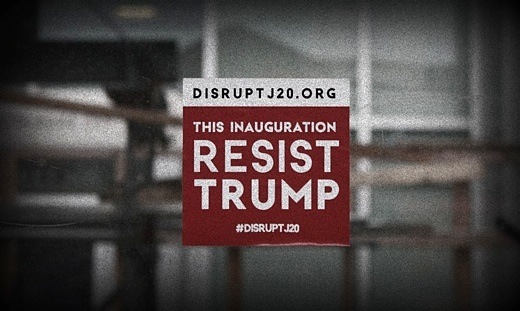 Image above: Poster for demonstration to resist Trump Inauguration distributed by DisruptJ20.org and #DisruptJ20. From original article. The Justice Department will attempt on Friday to defend a warrant requiring an internet host to turn over 1.3 million IP addresses of visitors to a website critical of the Trump administration. Dreamhost, the subject of the DOJ order, called it a “clear abuse of government authority.” The company has been fighting the warrant for months leading up to Friday’s court date on the matter. Federal prosecutors are seeking the IP addresses of anyone who visited disruptj20.org, a website hosted by Dreamhost, as well as the website’s database records, and the personal information of administrators and thousands of individuals who interacted with the site. Disrupt J20 organized one of the many Inauguration Day protests against the incoming Trump administration. Law enforcement officials believe the group was involved in one particular action that allegedly led to the injury of six police officers and $100,000 in property damage in downtown Washington, DC. After initially receiving the DOJ’s data request, Dreamhost requested the department narrow the scope of its warrant. US officials, instead, filed a motion in DC Superior Court forcing Dreamhost to comply with the warrant. Last week, the company responded by filing it’s own legal arguments against the sweeping DOJ order. “That should be enough to set alarm bells off in anyone’s mind,” the company added. The digital rights group, the Electronic Frontier Foundation has been providing “professional support” to the web host in its legal battle against the DOJ. “No plausible explanation exists for a search warrant of this breadth, other than to cast a digital dragnet as broadly as possible,” said EFF senior staff attorney Mark Rumold. Outside the digital realm, hundreds of people are still facing serious legal jeopardy stemming from the Inauguration Day protests. More than 200 people were charged with felony rioting, and could face up to a decade in prison. The Washington Post reported in April that DC police had actually infiltrated the group ahead of its planned January protest.